Are you looking for a trusted and reliable company to which you can outsource part of your kitchen cabinet component production? Look no further! Excelbois is a manufacturer of solid wood kitchen cabinet components specialized in providing subcontracting services to major cabinet door manufacturers in Quebec and Ontario. 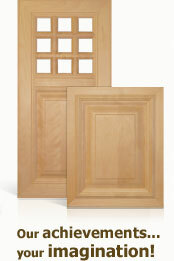 We specialize in the manufacture of solid wood doors with option of wood or chipboard central panels.